Created an in-house Information Security Intranet web site and worked with the users to add documents and links to the site for better use by corporate personnel. Created a Project Methodology web site that documents all phases, modules, and deliverables for creating or updating an application. This is used by the Security Division to setup time lines, resources, and necessary documents to ensure the security policy for the corporation are met by the user. I also reviewed, reformatted, and designed new forms such as the Project Security Checklist for project manager's use in detailing the necessary actions and documents needed for review by the Security Facilitator Reviewer. I created a `cheat sheet' for project managers and security reviewers to use detailing the phases of a project, the modules and deliverables. I also did miscellaneous project such as reviewing of the server audit trails and matching the audits against the Policy Standards. Failed audits were returned to the appropriate personnel for corrective action. All of this was accomplished using MindManager, DreamWeaver, Word, and Visio. Built a knowledge base using MindManager to detail the organization and design a new web site using DreamWeaver for the SIM Technology Group while maintaining the old SIM Tech web site using RoboHelp. Also became a member of the ICON (Intranet Standards) Group in order to discuss ongoing maintenance problems and set standards for in-house web sites. Used the knowledge base, standards from the ICON Group, and input from brain storming sessions with the SIM Technology Group to create a GUI interface for the SIM Tech web site using Photo Shop and DreamWeaver. Also used MetaBot to create a template and meta tags for searching the web site using an in-house search engine. Created and maintained the files on NT ClearCase. Created Release Notes for QA testing using Vantive and Packaging Notes for Release Management and created test cases for QA from Use Cases. The above projects were accomplished by using MindManager, DreamWeaver HTML Editor, MetaBot, Map This, Photo Shop, Paint Shop Pro, WORD for windows 6.0, Power Point Presentation Manager, Adobe Acrobat, RoboHelp 7.0, NT Clear Case, Vantive, and Visio Flowcharting Tool. Worked on a Data Warehousing project to document databases and reporting for BackOffice. Used PLATINUM Erwin 3.5.2 as a data-modeling tool to document databases fed by ADP and other vendors to feed the new CDR database-reporting project. Also documented report layouts using Micro Bank to include report fields and data base criteria for data selection for conversion to Acutate. Worked with Application Development Department to document the interfaces with other departments such as Quality Assurance, Modularization, Change/Release Control, NT Administration and so on. Detailed how the department documents work flows to use other department resources. Determined where bottlenecks occur and how they may be resolved. Set up a web site for inter-office access of related information plus listed related URL's that access other department documents that will make the Application Development Department a more productive area. Acted as liaison between the Information Technology Department (IT) and Quality Assurance Department (QA) to ensure Y2K testing of vendor packages were completed in a timely fashion. Created Assessment Forms and reviewed the test results and ensured the Y2K compliance memo of acceptance was submitted to IT for approval by management to complete the Y2K compliance testing phase. Also set up testing standards for the Year 2000 program changes and documented the test scripts for nine systems in the Montgomery Securities BackOffice Division. Assumed testing lead over three teams to coordinate and ensure the base line testing was followed correctly. 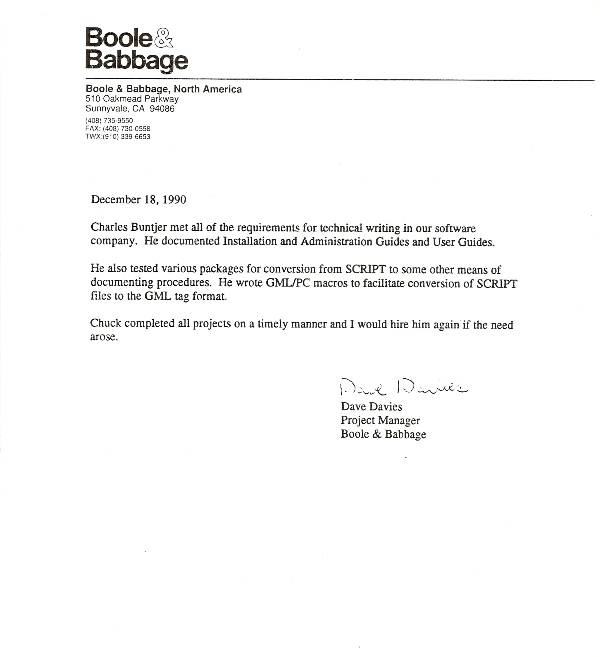 Documented results from the base line testing and used the results to set up the testing criteria for Y2K production testing for each test script. Tested systems against the current production environment and against the production environment with the Y2K program changes in place to determine if the results were the same. Finally tested the systems against the Y2K program changes with aged data to ensure all of the Y2K program changes match the test criteria. Results are reviewed and reliability determined by the auditors and the SEC for final approval of the Y2K testing for the first phase of reconfiguration of the Y2K interactive program changes. The above projects were accomplished by using WORD for windows 6.0, Power Point Presentation Manager, Adobe Acrobat, Excel, Visio, Front Page (HTML Tags), Actuate Developer, Micro Bank, PLATINUM ERwin 3.5.2 Data Modeling Tool, and AS 400 RPG programs along with GAMMA and Hawkeye. by using WORD for Windows 6.0.
by using WORD for Windows 6.0, SCRIPT, Ami Pro 3.0, and Aldus PageMaker 5.0.
by using WORD for Windows - Release 6.0, MS-DOS, VISIO, and the XcelleNet's E-Mail application. by using SCRIPT, WORD for Windows, CICS, OS/2, and ISPF. · Design, document, and publish a TCSI/ASAI Protocol Converter Installation Guide and User Guide. 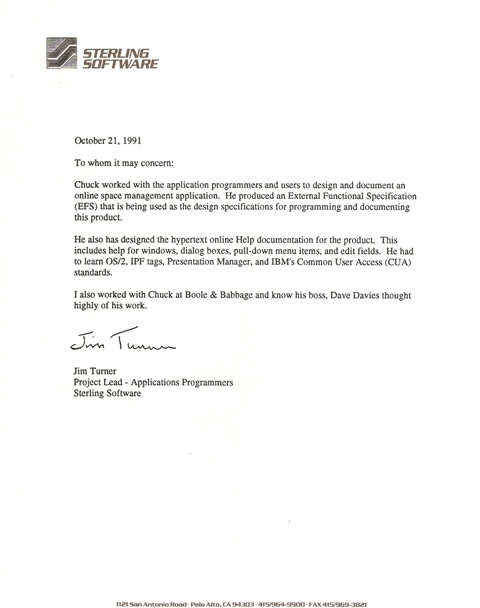 · Ability to work with Version 2.0a of Word, OS/2 and the DOS operating system. · an External Functional Specifications report from engineering, programming, and management input. I worked on capturing cashed checks for Wells Fargo using the automated check sorting and data capturing equipment. 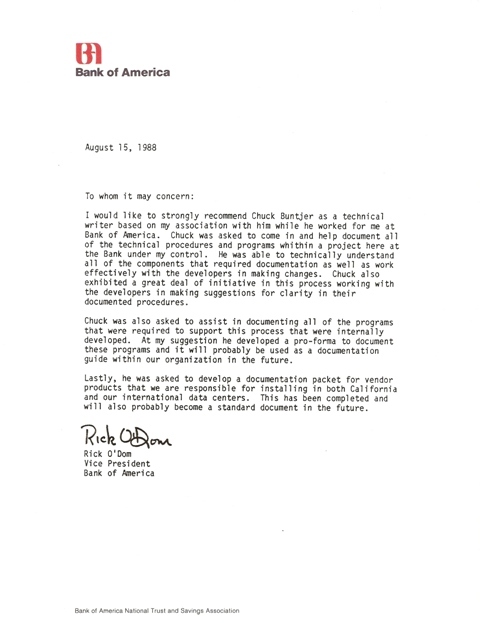 I then processed the information needed to balance the checks and made any corrections when necessary. I then forward tapes containing the days check cashing information to Wells Fargo to update their data bases on customer accounts. 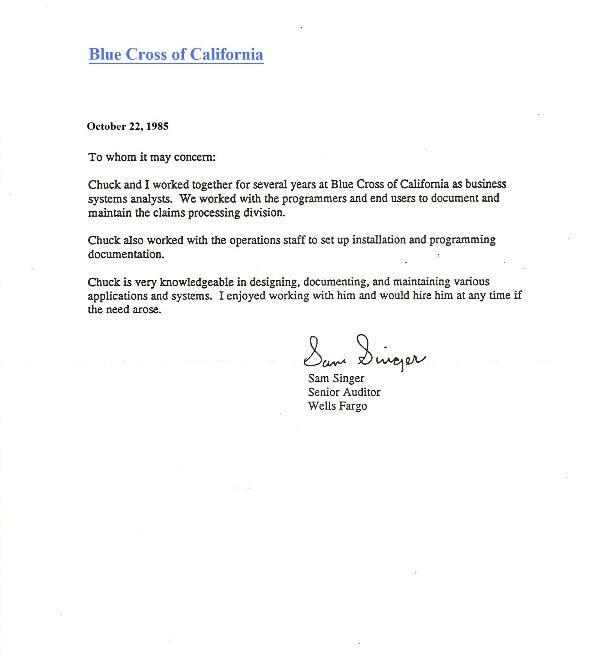 Manage personnel to produce computer generated output reports used to regulate troop movements and maintain stock of military material needed in six western regional states using IBM 403s. I worked at this company for a year before being drafted into the army. They manufactured fasteners for machinery and had the latest computer technology. I was asked to come back after my two years in the military but I soon had a job in San Francisco at Fireman's Fund Insurance. This company had at that time, the largest computer installation on the west coast, IBM Mod 20s, 30s, 360s, and 370s plus an old 1401 and 706! This was my second job and I used my Burgess Battery experience in wiring boards to process inventory and job orders at Anderson Brothers. They manufactured fasteners for military and industrial application. This was my first job and I was interviewed and hired to learn how to work in the Burgess Battery office setting up boards to process in house payroll, inventory, and billing. I was sent to downtown Chicago to learn how to wire boards used to calculate and print information from punch cards. I also learned how to wire a calculator using marks on cards created using graphic pencils. All in all, the latest in 'computers' at that time!